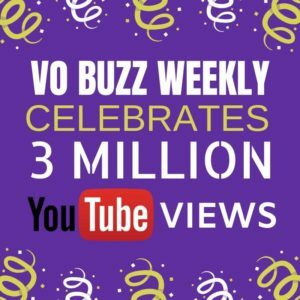 VO Buzz Weekly Producers and Hosts, Chuck and Stacey, hit another awesome milestone in their voiceover influencer journey. Their award-winning talk show’s YouTube channel hit 3 Million views in January 2019 and continues to grow on the daily! CLICK to watch hundreds of entertaining and informative videos on the VO Buzz Weekly YT channel! And while you’re there, don’t forget to SUBSCRIBE!